Today’s students will be tomorrow’s workers. As such, high student achievement is the benchmark, not only for an individual’s prosperity, but also for the prosperity of the nation as a whole. While success in school is dependent upon many factors, being present each and every day is critical, particularly for low-income students and students of color, who face a variety of educational barriers. Unfortunately, high rates of truancy—or unexcused absences from school—have become an increasingly challenging issue for educators across the nation. Time away from the classroom hurts a student’s chance to succeed. In fact, truancy is a distinct predictor of low student achievement and high school dropout rates. As a result, students who miss school may face lifelong economic consequences. In fact, truancy can be a gateway to the school-to-prison pipeline. Furthermore, truancy has repercussions far beyond the individual and can affect the overall success of schools, other students, and communities at large. In most states, truancy is considered a status offense—in other words, it is an offense that would not be considered unlawful for an adult but is considered unlawful for minors. Truant students used to be formally processed through the U.S. juvenile justice system until changes in the 1960s and 1970s, including the 1967 U.S. Supreme Court decision In re Gault and the Juvenile Justice and Delinquency Prevention Act of 1974. These moved truancy punishments away from institutional confinement and allowed for more discretion by both law enforcement and court officials. This shift reduced the caseloads of courts around the nation and reduced unnecessary burdens on the justice system. More importantly, it gave many young people an opportunity to make amends and return to their respective communities rather than enter the criminal justice system and potentially limit their future options. Now these cases can be processed through court diversion programs ranging from mentoring programs to parent training to direct provision of services. These diversion programs are often a collaborative effort between stakeholders such as students and their families, law enforcement, schools, government agencies, nonprofit institutions, and community members. Although discretion for truancy offenses is available and working in many jurisdictions, some courts still choose to process thousands of truant youth through the juvenile justice system each year. 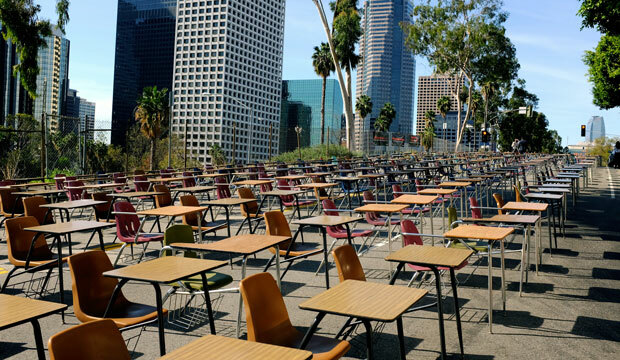 In 2012, an estimated 7.5 million students were chronically absent nationwide, and, according to several studies, low-income students and students of color were more likely to be absent. This is disconcerting given that, in 2013, 14.7 million children were living in poverty nationwide. In fact, the child poverty rate of 19.9 percent was significantly higher than the poverty rate for working-age adults at 13.6 percent and seniors at 9.5 percent. Additionally, high school absenteeism rates for students of color are particularly troubling because our nation is becoming increasingly diverse: People of color are projected to be the majority of the U.S. population in the early 2040s. More than half of all babies born today are children of color, and for the first time in history, the majority of the 2014–2015 public school K-12 population is projected to be students of color. As the United States undergoes these drastic demographic shifts, it is even more important for leaders to take action now, as the cost of truancy is simply too high. The nation can and must prevent truancy, starting from the earliest grades and continuing all the way through high school. While the causes of truancy are vast and include individual, familial, and community influences, school policies can actually discourage attendance. The recognition of this fact has made early intervention on school attendance a focal point for educators and policymakers in order to increase academic achievement and high school completion amongst students. Develop a national definition for truancy, chronic truancy, and chronic absenteeism. Developing a national definition for truancy, chronic truancy, and chronic absenteeism is important for increasing transparency and for identifying trends and solutions, particularly in communities of color and low-income communities. National, standardized definitions also allow for state-by-state data analysis. Improve data collection for early warning systems. Early warning systems are only as good as their data. States, school districts, and schools should work together to share data—while protecting student privacy—to ensure that the most timely and accurate information is available to the educators and staff providing intervention supports. Increase wrap-around services and aligning them with student needs. Reducing truancy rates should be an all-hands-on-deck approach in order to support students. This might mean that schools work with social workers, counselors, mentors, tutors, after-school or early learning programs, and health or social service agencies to provide students with the support they need. It may also include partnering with nonprofit organizations to increase schools’ capacity to help provide for students’ needs. Reduce punitive policies. Schools, districts, and states should evaluate their anti-truancy policies, including zero-tolerance policies, and make punitive consequences, such as ticketing, fines, or removal from the classroom, a last resort. Increase parental involvement and the accessibility and availability of education programs. Schools should consider increasing parental involvement and education in anti-truancy programs. Because truancy is often a product of factors occurring at home, involving parents in solutions is imperative. This should happen through parenting classes or specific parent engagement programs. While truancy is a serious problem in schools across the United States, the good news is that solutions to help keep students in school do exist. Investing in these solutions is an investment in the students who will be the next generation of workers, innovators, and leaders. It is an investment in our nation’s future—for both individuals and the economy. Farah Z. Ahmad is the former Senior Policy Analyst for Progress 2050 at American Progress. Tiffany D. Miller is the Director for Education Policy at American Progress.